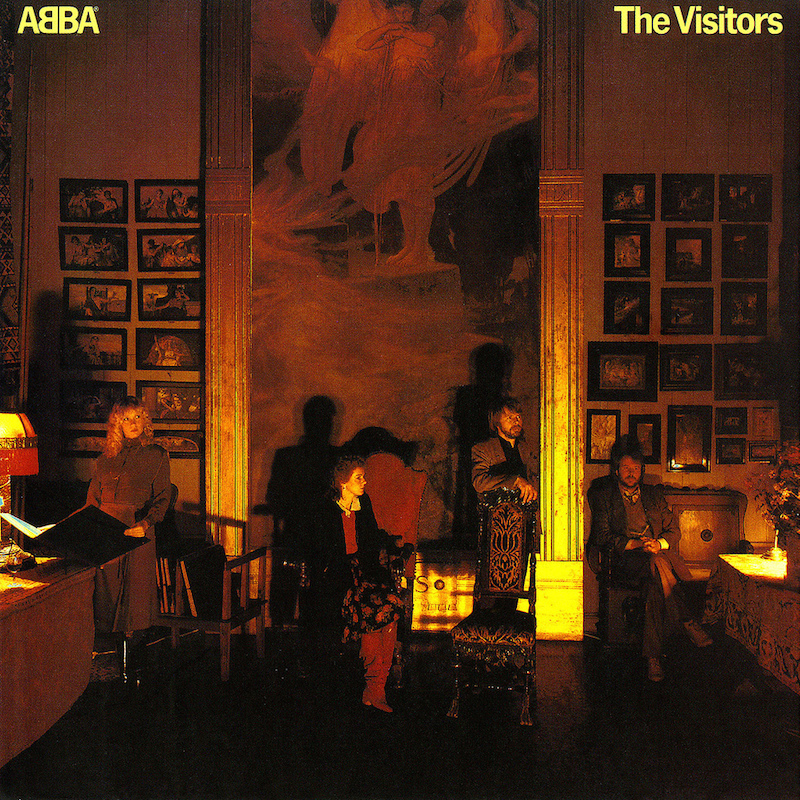 Today’s POP RESCUE is the 1981 8th and final studio album The Visitors, released by those Swedish hit-makers ABBA. Unlike any ABBA album that i’ve ever looked at, I looked down the track listing of this one and saw not one track that I recognised. Despite that, I picked this album up after a recommendation from my friend Patrick, who told me to buy it if I should ever stumble across it. So, here we are. This 9-track album is home to just two singles – One Of Us, and Head Over Heels, but neither song sounds even vaguely familiar. The group entered the studio shortly after the divorce of Benny Andersson and Anni-Frid Lyngstad was announced, and even the artwork suggests a group fragmenting – with the quartet standing apart on the cover. The album opens with the title track The Visitors and it starts off with an electronic pulse, before some highly effected vocals from Frida break in. This ABBA doing electronica, and this track would be a credible addition to a modern electronica album now. Second track, and final single Head Over Heels is an almost French sounding track, although it does embrace a familiar chorus vocal style that reminds me of their previous album Super Trouper, and also of track Gimme Gimme Gimme. Third track When All Is Said Is Done is the first here to give an insight into what was going on within ABBA, opening with the lyrics ‘Here’s to us, one more toast and then we’ll pay the bill’ and ‘..neither you nor I’m to blame when all is said and done’. It’s the ending. The final stand of one of the most successful groups. This track was released as a single in the US. Up next is Soldiers, which feels like a nod to the Cold War. Musically, it’s not very easy to follow. I Let The Music Speak is a somewhat down-beat track, again picking up a more regimental them, but with a Russian sound coming in at about 1:30. Musically, at times, this track could have been a Bond theme. Following this is the lead single from the album, One Of Us, which returns to the theme of regret, and hints of the break-up within the group. This single reached #3 in the UK. Two For The Price Of One is up next, and it’s time for Bjorn to take the vocals. I really like the bass on this track, it sits perfectly alongside the beat. It’s quite up-beat and fun – there’s even a telephone call in it. At times in the verses, it reminds me a little bit of Video Killed The Radio Star by The Buggles. Next up is Slipping Through My Fingers, which has some great vocals from Agnetha and Frida. Again, it’s a song about regret, adding to the sense of ending that this album carries. A childish but slightly eery sounding child’s music box opens the final track Like An Angel Passing Through My Room – with vocals that sound like they are sung in an empty room – perhaps a loft, sparked by the discovery of this music box. Backed by some gentle synth strings, and the ticking of a clock. This is a sad but beautiful song, about regret and lost love. And that’s it. A lost love indeed. This album is not the sing-a-long cheery ABBA that has dominated the sound of their legacy. There’s no Dancing Queen here, and that alone makes this album far more interesting. This album may take more listens to get in to, and therefore it may improve on the rating i’ve given it. Whilst I don’t deny ABBA’s ability of making great pop music, they are also guilty of nauseatingly twee songs. 1981 UK CHART POSITION: #1 and certified Platinum. POP RESCUE COST: £2.99 from a That’s Entertainment store. Posted in 1980s, ABBATagged 1981, Agnetha Faltskog, album, Anni-Frid Lyngstad, Benny Andersson, Bjorn Ulvaeus, electro, Head Over Heels, One Of Us, review, The VisitorsBookmark the permalink.